Kaycee had just awoken from her nap. She was playing on the floor next to me, as the girls and I curled up and watched Treasure Planet. It was a rainy day and Kris and Kaycee had both been under the weather. 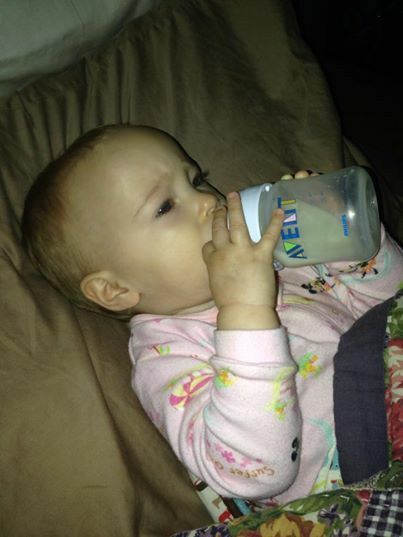 Kris had the flu for the last many days and Kaycee had just developed a cold. We were having a quite and restful day. Kris was slowly waking up and getting ready to join us on the couch for the movie and time as a family. Just a few moments after Kaycee had begun playing in the toy kitchen just behind me, she crawled over to the couch, pulled herself up, and started making an odd coughing sound. I looked over at her and noticed that she was moving her tongue in such a way to indicate something was in her mouth. I immediately put my finger in her mouth to push it against her cheek and pull it out. I tried to remain calm. But when I touched the object it slid past my finger and towards her throat. I tried to hook it again, but it went deeper. I tried to remain calm. And I shoved my finger to the side of her throat to hook it once more. As it slid deeper, I threw my body over the side of the couch and flipped her over to begin hitting her back. She squirmed and began to cry. She slipped from my hands and I fell onto her back. And I couldn’t remain calm anymore. I began to scream. Violently scream. I screamed, grabbed my phone, and quickly tried to dial 911. As it rang, I threw open the front door and began running outside into the rain, hoping that my presence outside would bring some some sort of miracle and I would be able to flag down the paramedics. I began screaming to dispatch. “4311 CENTRAL AVENUE. MY BABY IS CHOKING. SHE IS DYING. PLEASE COME. 4311 CENTRAL AVENUE. MY BABY. MY BABY.” I kept repeating my words as dispatch kept asking me to calm down. Kris ran into the midst of traffic, dozens of cars driving by in the downpour of the rain. He ran across the street to the workmen’s comp clinic, hoping to find a doctor or paramedic nearby. The cars came screeching to a halt. I chased him to the curb, screaming, “MY BABY. HELP. SOMEBODY. HELP.” Neighbors came out of their homes, cars stopped, a man approached Kris. It later dawned on me that all of the cars and people on the streets were stopping because they thought Kris was kidnapping the baby. But even with people approaching, Kris didn’t stop running. Into the clinic, but out again with no avail. No one to help. My eyes stayed on Kris and the baby as I continued to scream. Dispatch kept telling me to calm down and that someone was on their way. Just then…black and white. A black and white was driving by. Driving by to another call down the street. Not for us. I threw myself out into the traffic and screamed, “PLEASE STOP. PLEASE STOP. PLEASE STOP.” The police officer pulled over. However, believing too that Kris was trying to steal the baby she almost got back into her car to chase him. But in a split second, she realized that Kris was now running towards her and not away. She knew something was wrong. I learned later from Kris that he believed Kaycee was going to be dead, and felt she should spend her last seconds with both of us. And so, he had begun running back in my direction. By the grace and amazing hand of God, Kris had begun running back towards me just as the police officer had started approaching me. Kris quickly handed Kaycee to the police officer and she immediately began hitting her back. She checked in her mouth and could feel the object but it was too far in. Then back over again and HIT HIT HIT. She then hooked her finger in…and PRAISE THE LORD…pulled out a plastic water bottle cap covered in phlegm and blood. And Kaycee cried. She cried and coughed and cried and cried. And I held her in the rain and cried and cried. Dispatch was still on the phone. The paramedics were still on their way. Dispatch began yelling at me, “Ma’am, what is happening?” By that time, I had enough of dispatch and threw the phone at another officer who had arrived at the scene, “Here, you talk to dispatch.” And I held my baby and I cried. I looked over to our home and saw Sadie Rose and Dani, standing panicked and fearful on our porch. The precious little girls never left the porch. In the fear of the moment, they followed our directions. Praise the Lord. Our neighbor Shannon came to their side and took them into the house. When I stood up, I saw multiple police cars surrounding the area. They had all stopped. One officer even opened his back seat door and released the man he had in custody. Apparently, our situation called for more attention (my apologies to the community that is not being disturbed by the drunk in public wandering the streets). The officers helped me to my feet, and helped me to the house. I couldn’t stop crying and screaming and holding Kaycee. The blood and vomit continued. Was this nightmare not over yet!?! Please dear God. In the small of our entry way four or five police officers came in, followed FINALLY by the paramedics. Notepads came out. Questions asked all around us. A blur. They would need to take her by ambulance to the hospital. Kris got her carseat and gave it to the paramedics. He then told me that we would let her go by herself with the paramedics and we would follow. I panicked. No, I could not let her out of my sight. The paramedics pleaded with me that she would be fine. Kris assured me she would be fine. We would follow right behind. I said goodbye to Kaycee and I climbed out of the ambulance, acknowledging that I may never see her again. Back in the house, Kris tried to calm me down once more. I couldn’t cry. I couldn’t stop shaking. I was focused on one thing only. My shoes. I needed to find my shoes so I could drive to the hospital. But then…I was reminded of Sadie Rose and Dani. I didn’t want them to be afraid. So, I grabbed their “B” and their “I” along with their princess dolls and walked over to Miss Shannon’s house. Praise the Lord for candy canes and cartoons. The girls were delighted and doing just fine. I let them know we were going to go see Kaycee at the hospital and everything was going to be fine. Was it? Was it a lie? Was everything going to be fine? Panic began to set in again. I walked back into our house to get the diaper bag and my coat. Why would the diaper bag matter? Did it really matter if she was dying? And why my coat? I was already soaked with rain. Nothing made sense. I told Kris I would be waiting in the car, as he locked the house and grabbed his own shoes. Did I mention that his head was still spinning from having the flu? This man. Amazing man. Sick as a dog just moments before, running through the rain and traffic to save the life of our baby. Amazing man. Kris and I tried to talk as we drove. I tried to stay distracted away from the panic, but to no avail. It came in waves. Like the rain gushing down. And then the best phone call I have ever received. My mother had arrived at the hospital before us. She was holding Kaycee. Kaycee was smiling. And the doctors said she would be ok. Moments later we pulled into Kaiser and ran across the parking lot. Into emergency we were led and into a massive room with a little baby girl in pink, crying. Covered in blood and spit up. But crying. And alive. And oh so very happy to see her mommy. I sat on the hospital floor and rocked her in my arms. We just held each other. And I cried. From behind me, I saw the uniforms. Three police officers entered the room. The female officer that had saved her life, followed by her sergeant and her lieutenant. A few questions were asked, but primarily, we all just wanted photos. 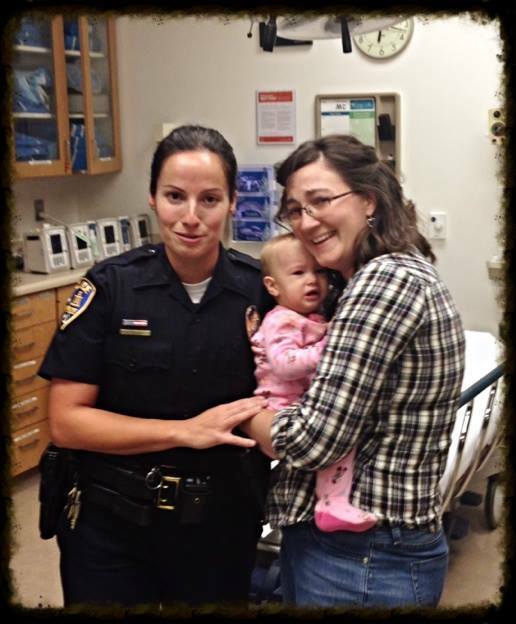 Photos of baby Kaycee and the woman who saved her life. Her name is Janet. She wanted a picture too. Her sergeant informed us that Office Janet Ramos was a decorated medical vet from Iraq. She had saved many lives, and was probably the best person to have on the scene. Embarrassed by the compliment, Officer Ramos quickly interjected, “But this was the first baby.” We smiled and praised the Lord. We were released from the hospital just minutes later, and with a goodbye hug from Officer Ramos, we were out the door. Out the door with our baby Kaycee, alive, breathing, crying. And oh, her crying was sweet. Crying. Life. Home now. The evening has come. 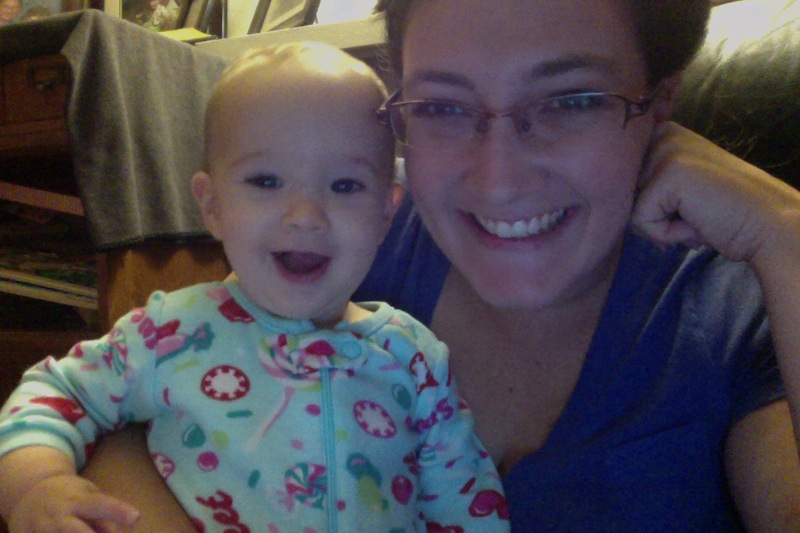 The girls are all asleep in bed, and Mommy and Daddy are quickly headed in that direction. But before the night came to an end, I need to write this story. The story of God’s amazing sovereign and miraculous hand of protection over our family. Every. Step. Everything orchestrated perfectly by God. I will never forget this day. The trauma will continue in my mind. But tonight, I can praise God… Praise God for my baby girls ability to crawl to me, stand up and tell me something was wrong. Praise God for my husbands ability to keep the cap from lodging further and for running into the rain to save her life. Praise God for the rain that slowed down the cars as they drove by our home. Praise God for the call that was made a few blocks down forcing Officer Ramos to be driving by our home. Praise God for her medical training and quick thinking. And tonight, I praise God for my crying baby…who is alive. OH. MY. Heavens! I am crying right now. What an incredible, amazing, terrifying story! SO glad she is okay. And Office Janet Ramos is my new hero. Mary!!! Oh thank you for sharing this story. I have tears in my eyes. Praising Jesus. Praising God. Thank you Lord for working a miracle and saving this sweet baby’s life. We give you the glory God! Thank God she is doing ok, I read this and actually felt your panic, your fear and your relief. Now as I wipe the tears from my eyes and get ready for Church, I will be sure to ask for praises and prayers to God for you and your family. Have a blessed Sunday. Thank you Jesus! Hugs to all of you! Praising God with you sister. The ladies of P31 G23 will be praising as well when I share this with them. Praising the Lord along with you all and thanking Him for sending Officer Ramos!! I’m 2 doors down, was not home till it was all over and I saw the ambulance driving away but please know I immediately started praying as soon as I pulled up, I may not have known what was happening but the Lord knew and He was covering the situation!! God is good!!! Kaycee.. Reading your reflection brought me to tears. God placed angels to help you in a time of great trouble. Praising God and wishing you peace and comfort! (OBS Prayer Warrior Team). Praise God!!! Hallelujah!! He is the great Healer, Miracle Worker!! He knew who to have there near your home just at that moment. ((HUGS)) P31 Group 24 is praising with you, sweet sister!! Mary — I was on David’s fb about ten minutes after you posted about the emergency… so grateful to God for a happy ending and so sad for the terror you and Kris experienced. My heart is moved by the way you recounted the details of your experience… God is almighty! I wish I was there to hug you and Kris. I had Eva read your story. Our hearts go out to you and Kris. Love, Kim B. Praising God and rejoicing with you!! Thank you Lord Jesus for saving this precious child and for all the people that came to her aid. My goodness what an experience you all had. Praying for you all as you recover from this. God truly had His hand all over this!! Amen Trish. Your prayers for our recovery are a blessing. OH MARY! that was so scary! It brought back memories of a similar situation that happened with us and our son about 40 years ago………….only it was one of those push pin tacks he swallowed. Thank you Lord for watching over your child and ours. Our son is now serving as a missionary in Bolivia South America. God is good! Judy, what am incredible testimony of Gods hand in your sons life. I pray that 49 years from now, we too can say the same thing of Kaycee. From what I can see of your heart Mary………….you will be saying the same things about your Kaycee! Thank You Lord! I have had the pleasure of working with Mary in ministry, and I can attest to her heart for people and her desire to live the life God has for her. Sometimes that life takes us through some very terrifying places. Mary’s story is a reminder of God’s care and provision in those times, and is nothing short of miraculous!